Below are two videos I did featuring two flexible low cost wireless methods for remote long distance control of LXI instruments. This is for test / datalogging / data acquisition applications where there is no Ethernet or other network available, for instance when doing outdoor test measurements. The first video features using an RF Ethernet Bridge and the second video features using a cellular router. In each video a particular instrument is featured, but the remote long distance control method discussed could be used with any LXI instrument. The digital multimeter or DMM offers two methods for measuring resistance: 2–wire and 4–wire ohms. For both methods, the test current flows from the input HI terminal and then through the resistor being measured. For 2–wire ohms, the voltage drop across the resistor being measured is sensed internal to the multimeter. Therefore, test lead resistance is also measured. For 4–wire ohms, separate "sense" connections are required. Since no current flows in the sense leads, the resistance in these leads does not give a measurement error. In this blog post I will discuss some general considerations and tips when making DMM resistance measurements. 4-wire ohm measurement use the HI and LO DMM leads as well as the HI-Sense leads (that is why they are called "4-wire"), the setup for a 4-wire ohms measurement is shown below. The sense leads essentially extend the DMM measurement to the DUT junctions instead of the HI and LO terminals . This eliminates the voltage drop across the HI and LO leads caused by the test current. Since the sense leads are high impedance there is essentially no current flow into the sense inputs. The 4–wire ohms method provides the most accurate way to measure small resistances. Test lead resistances and contact resistances are automatically reduced using this method. Four–wire ohms is often used in automated test applications where resistive and/or long cable lengths, numerous connections, or switches exist between the DMM and the DUT. Modern DMMs offer a built-in function, often labeled as "Null" or "Math", for eliminating test lead error.To use the Math function on a DMM you short the test leads to together. The Math function will then make a resistance measurement of the test leads and store it. The DMM will then mathematically subtract the measured lead resistance for subsequent resistance measurements to cancel out the lead resistance error. When measuring resistors designed for temperature measurements (or other resistive devices with large temperature coefficients), be aware that the DMM will dissipate some power in the device–under–test. If power dissipation is a problem, you should select the DMM's next higher measurement range to reduce the errors to acceptable levels. The following table shows examples of Agilent's 34410A and 34411A DMMs source current for various measurement ranges. When you are measuring large resistances, significant errors can occur due to insulation resistance and surface cleanliness. You should take the necessary precautions to maintain a "clean" high–resistance system. Test leads and fixtures are susceptible to leakage due to moisture absorption in insulating materials and "dirty" surface films. Nylon and PVC are relatively poor insulators (10^9 Ω) when compared to PTFE (Teflon) insulators (10^13 Ω). Leakage from nylon or PVC insulators can easily contribute a 0.1% error when measuring a 1 MΩ resistance in humid conditions. On September 13, Agilent introduced the low-cost M9181A 6.5 digit PXI digital multimeter. The M9181A provides the most common measurement functions such as DC voltage, DC current, AC voltage, AC current, 2- and 4-wire resistance. 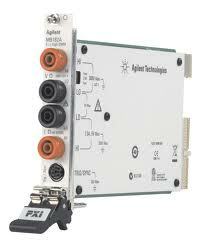 Other Agilent PXI family members include the M9182A and M9183A which provide higher throughput and better accuracy as well as additional measurement functions such as capacitance and temperature. Agilent just released the M9036A a new embedded PXIe controller, which enables a compact platform solution. 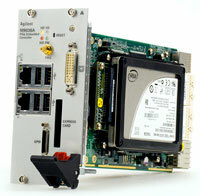 With the 2-link, 2x8 Gen 2 backplane configuration, it is an ideal match for the Agilent M9018A PXIe chassis. This three-slot module easily integrates into hybrid test systems using GPIB, USB, and LAN with the built-in front panel interfaces. Built upon a mid-performance Intel Core i5 dual-core processor with Hyper-Threading Technology, the M9036A is designed for applications in multi-tasking environments. I am excited to announce that Agilent just launched a website where you can download free of charge smart device programming tools and examples for instrument control. What is a smart device you ask? Smart device refers to the smart phones and tablet PCs that continue to become more and more a part of our personal and professional computing and connected lifestyle. One of the big benefits of smart devices for test and measurement is they offer the ultimate in ubiquitous access to test data and instrument control. They are natural fit with LXI instrumentation since they can communicate with an Ethernet network, either using Wi-Fi or through a cellular provider’s network via the Internet. One of the challenges today of using smart devices for Ethernet based instrument control is there is a not much smart device programming experience out there and there is a lack of smart device programming tools specific to the test and measurement industry. Agilent is working to change that by providing programming tools and example code for Apple’s iOS and Google’s Android specifically designed for LAN / LXI instrument control. The first programming tools and examples we are rolling out are for instrument IO. When you create instrument control software on a Windows-based PC, many IO tools are available, such as VISA and IVI-COM drivers, that make instrument programming easier by doing all the low-level connection management and data handling for you. Unfortunately these tools and drivers do not exist for smart device programming environments until now. The IO programming tools can be downloaded below for both the iOS and Android. Also below you will find other links for content related to LXI instrumentation and using smart devices for instrument control. Also on the webpage you will find an email node. Please feel free to use this email node for any questions you have on using the smart device programming tools and for suggestions on future smart device programming tools you would like to see. The link for the new webpage can be found below, enjoy!